New Delhi: A deal at Copenhagen is well within the realm of the possible, according to a study released before the climate conference, which began on Monday, that adds up existing proposals and pledges from countries on emission reduction, and sees whether this fits in with the articulated goal of limiting global average temperature rise to 2 degrees Celsius. The study, by the United Nations Environment Programme (UNEP), shows a small gap between what is needed, and what has been promised or pledged, in terms of emission reduction, for this target to be met. The 2 degrees target is consistent with what the Intergovernmental Panel on Climate Change has recommended as the maximum allowable limit for global warming. The Group of Eight economies has also pledged that it will work towards the same goal. The study takes into account recent declarations made by emerging economies such as China, India, South Africa and Brazil, and their associated emission reduction targets. India, for instance, announced on 26 November that it will domestically cut its emission intensity by 20-25% below 2005 levels by 2020. China had earlier put forth its own target in terms of a cut in carbon intensity. According to the UNEP report, a 2 degrees goal translates into 44gt of carbon dioxide, or CO2, equivalent. If the declarations by countries are taken at face value, the total works out to 46gt in 2020, leaving a gap of 2 tonnes, compared with today’s 47gt. The analysis takes into account the fact that the pledges of some countries are contingent on action by other countries. The emission reduction pledges from Brazil and Indonesia, for instance, are dependent on international help. The report also assumes the creation of a system of rules which will account for emissions in the land use, land use change and the forestry sectors. According to the report, “current proposals will take developed countries to around 16gt and around 16% below 1990 levels". But it adds that reductions only from developed countries are not adequate to meet the 2 degrees target. 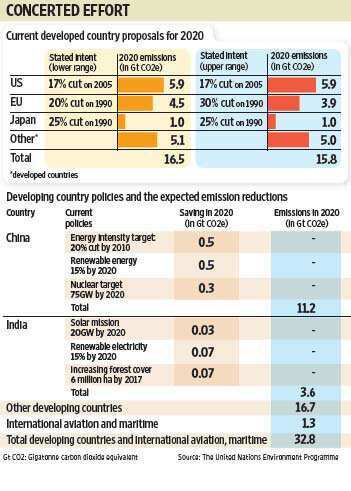 Details of how emission reduction targets will be split between developing countries and developed ones have formed the basis of climate talks. Developing nations that are not historically responsible for most of the emissions have demanded that rich countries take deep cuts in emissions and also compensate developing countries through finance and transfer of technology. The UNEP report explained that developed nations should deliver substantial financial resources to support the willingness of some developing nations to implement ambitious policies, because without these, the world would be unable to control its emissions. AP contributed to this story.